Taken 9/2/17. It was overcast and drizzling, but the water coming down the front of the dam looked like snow. I took this picture from the middle of the 2005 bridge. The earlier bridge, built in 1937, about 10 years before this dam was constructed, was named in honor of Oscar Byrd Lovette – lawyer, Republican, banker – who defeated Carroll Reece in 1930 for the 1st District seat in the U. S. Congress. Reece came back to defeat Lovette in 1933. The place where the earlier picture was taken is no longer accessible. 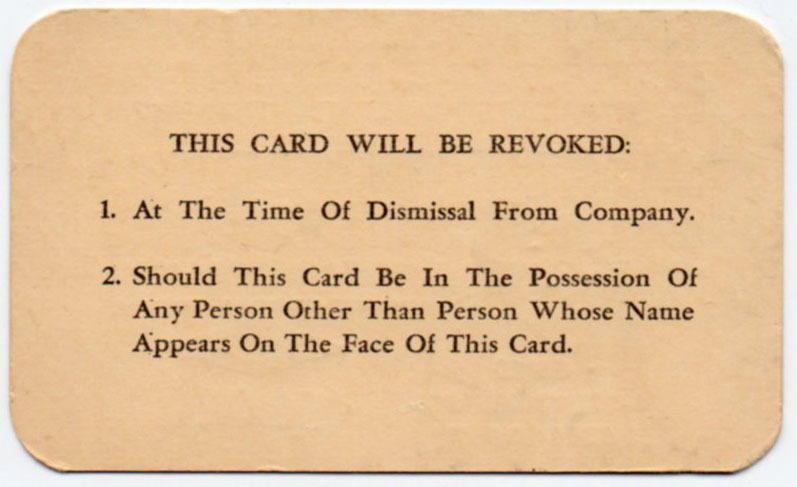 Well, it’s a fake of necessity. 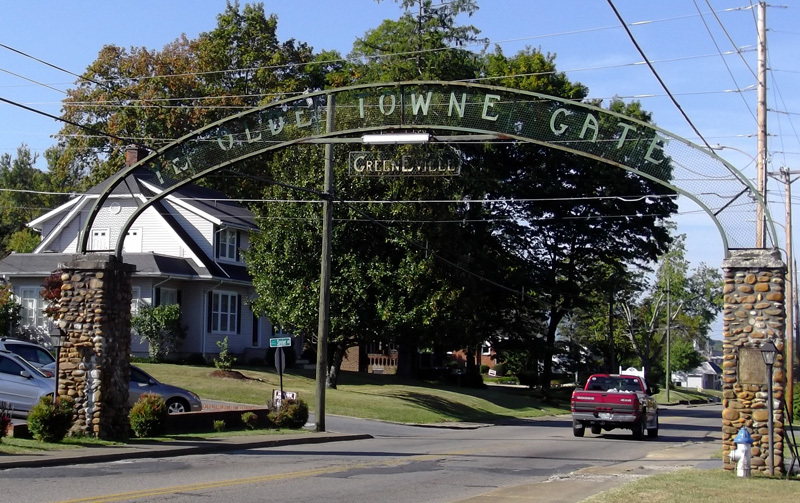 This “YE OLDE TOWNE GATE Greeneville” sign goes over Tusculum Boulevard at Sevier Street in Greeneville TN. 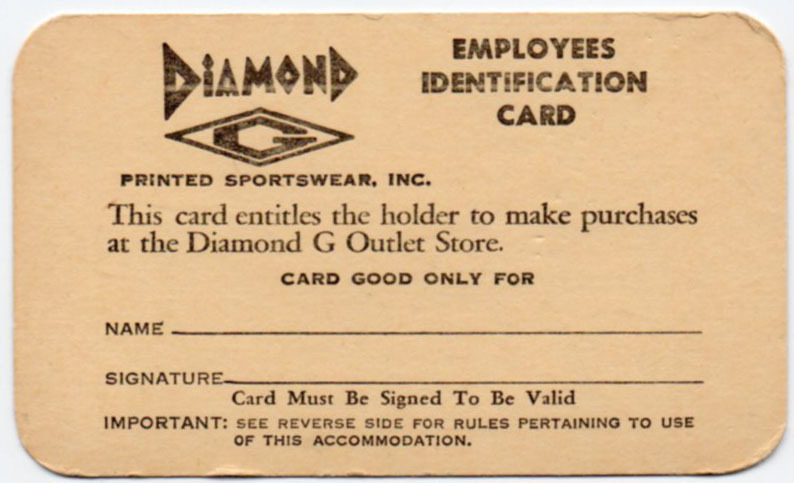 The original sign was put up by the Cherokee Club, a women’s group, in 1925. It was replaced by this aluminum replica when Tusculum Boulevard was widened. I can’t pin down a date on that. Rats. 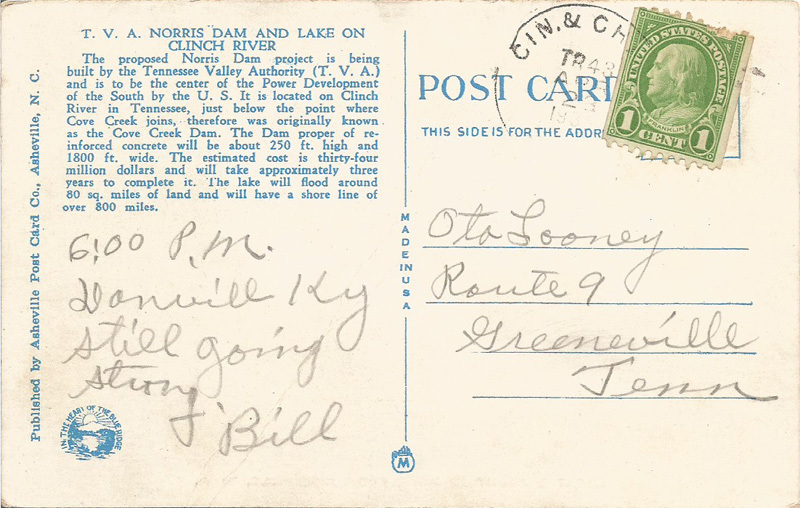 This is an Asheville Post Card issue that was developed from a TVA pre-construction drawing of Norris Dam. 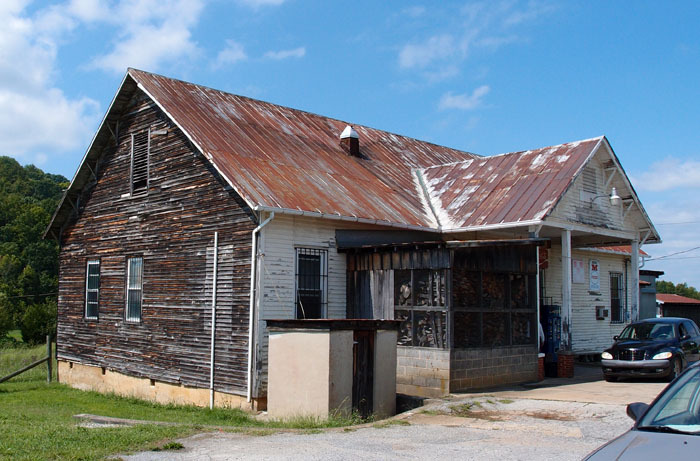 Norris was built between 1933 and 1936. 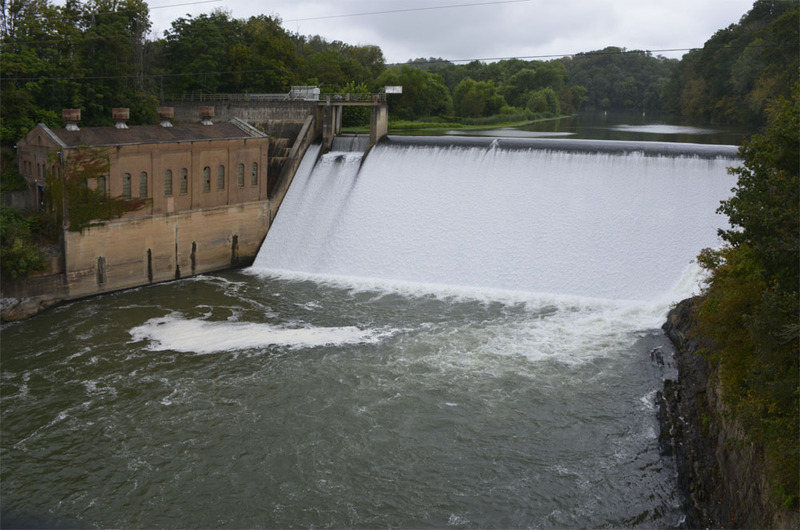 If you go to Google Earth and enter “Norris Dam” you’ll see that the finished dam looks pretty much like this. Not bad for nearly 80 years. 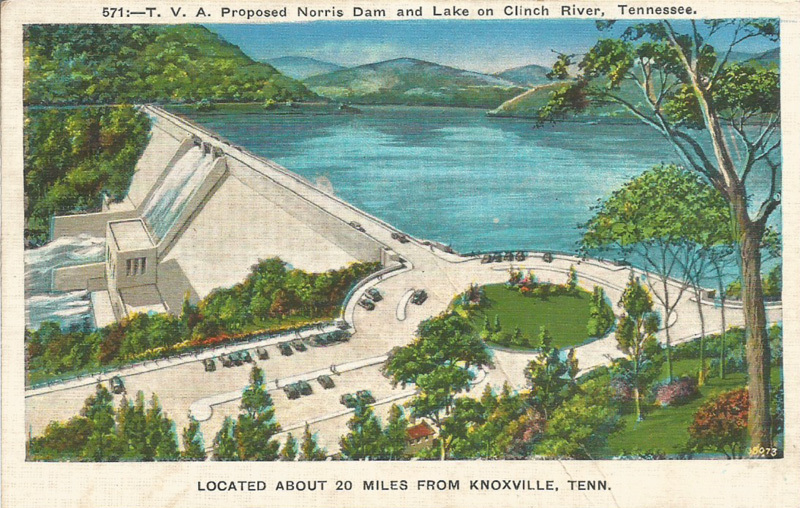 The proposed Norris Dam project is being built by the Tennessee Valley Authority (T.V.A.) and is to be the center of the power development of the South by the U.S. It is located on Clinch River in Tennessee, just below the point where Cove Creek joins, therefore was originally known as Cove Creek Dam. The dam proper of reinforced concrete will be almost 250 ft. high and 1800 ft. wide. The estimated cost is thirty-five million dollars and will take approximately three years to complete it. The lake will flood around 80 sq. miles of land and will have a shore line of over 800 miles. 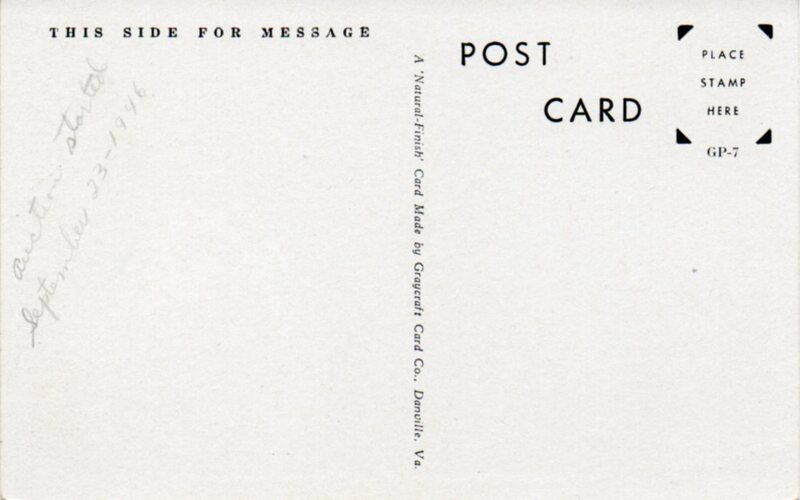 Apparently, Asheville Post Card Company’s slogan in the 30s was “In the Heart of the Blue Ridge”. It’s in the blue circle to bottom left. 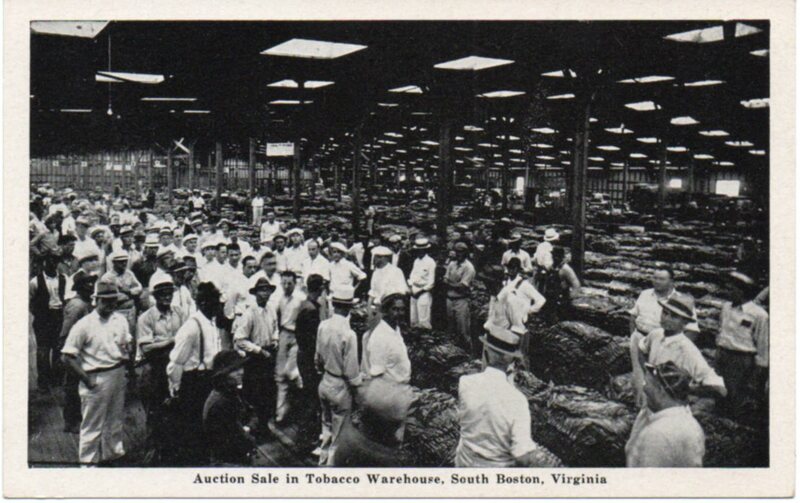 The blue circle on the right is a union designator, I think. I dislike being vague, but I can’t tie this down to any specific thing…in the past, I’ve seen symbols in this area that clearly were union originated.